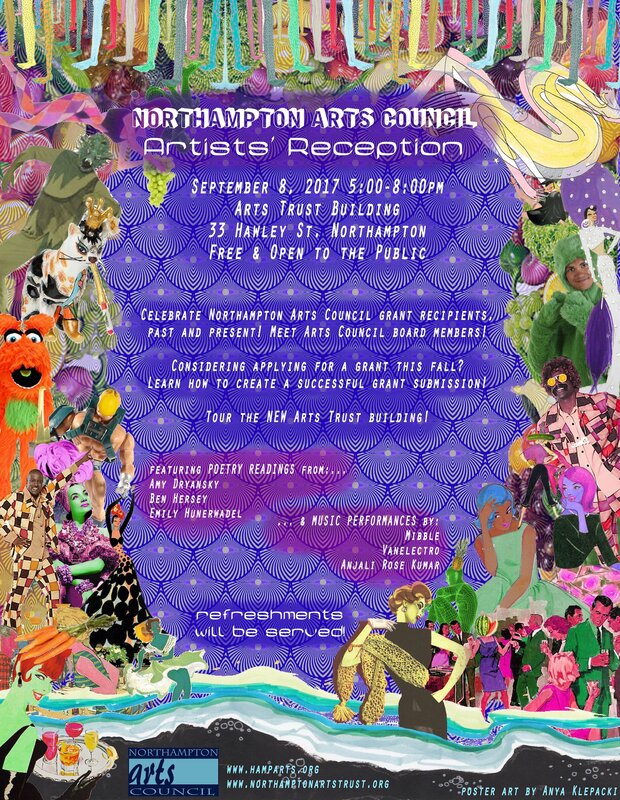 The first annual Northampton Arts Council Artists’ Reception will be held September 8th from 5:00 pm to 8:00 pm to coincide with September’s Arts Night Out. It will be held at the Center for the Arts’ space in the new Arts Trust Building at 33 Hawley Street, which will have just opened to the public. The Arts Trust board will be giving tours of the building. The event will be a chance for the Arts Council board to meet all the current grant recipients, and for these grantees to meet many from past grant rounds, spring and fall. In addition, new grant applicants for this fall will be encouraged to attend, to learn how successful applicants and projects are wrought. “The evening is meant to bring all the disparate parts of our amazing arts community together in one room to celebrate one another and our city,” says Myers. There will be a poetry reading by Northampton Poet Laureate Amy Dryansky, grantee Ben Hersey, and local poet Emily Hunerwadel. Music performances by Mibble, Vanelectro and Anjali Rose Kumar. Images from art shows, performances, and other arts projects funded by the Arts Council will run on multiple screens while music, food, and drink are served. Perhaps most significantly, it will be the perfect opportunity for confused citizens to straighten out the differences, hopefully once and for all, between the Art’s Council, the Arts Trust, and the Center for the Arts.